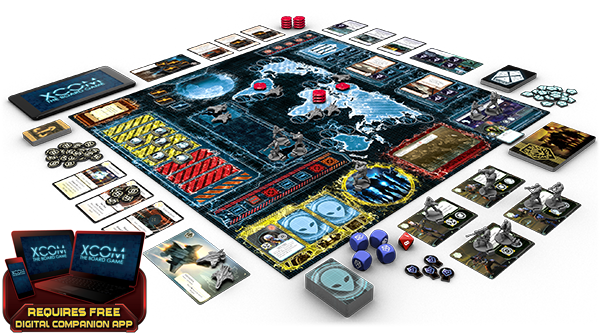 In XCOM: The Board Game, the alien invasion is unrelenting. UFOs appear in orbit, alien combatants wield technology far more advanced than anything the world's militaries have ever seen, the world's nations teeter on the verge of panic, and civilization threatens to devolve into chaos. At the heart of the invasion is the game's free digital companion app, which coordinates the invaders, heighten's the game's tension, allows you to play at multiple levels of difficulty, and keeps you on your toes with turn sequences that can change from round to round. More than that, though, the app also teaches you how to play the game, and it serves as your rules reference, easily accessible at the click of a button. However, as you race to save humanity from an unknown enemy, it may be comforting to pause, take a breath, and review your situation in a new light. 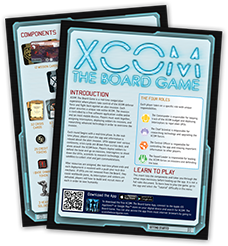 The science division has been busy, and for those who want to access the rules outside of the app, we have now uploaded pdf versions of the XCOM rules insert (pdf, 4.5 MB), game overview (pdf, 3.1 MB), and rules reference (pdf, 4.7 MB). 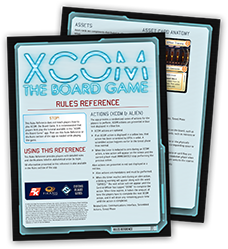 Click the above icons to download the XCOM rules insert (left), game overview (center), and rules reference (right). 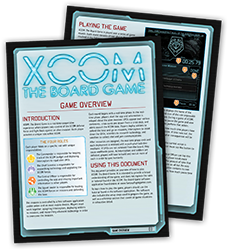 These documents are all currently available in the game's support section.